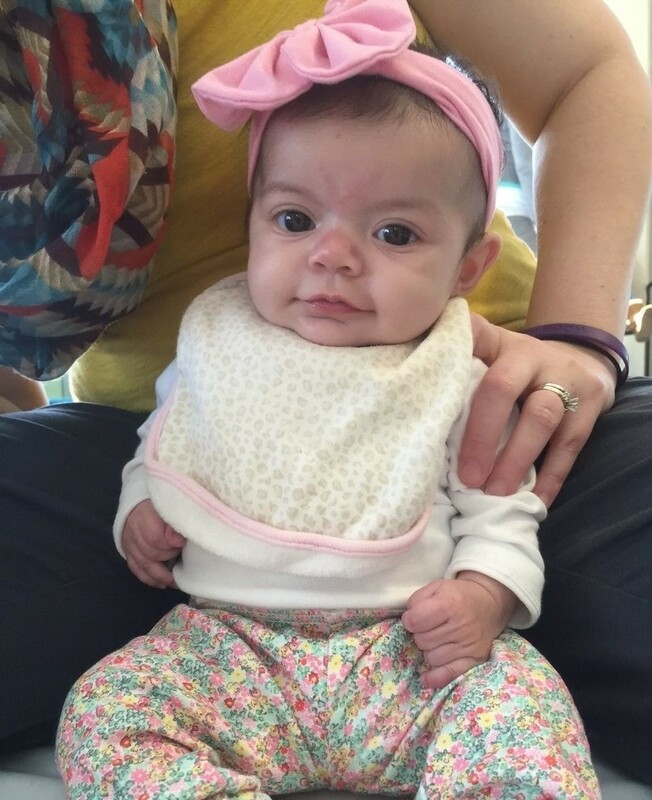 Beautiful 3-month-old Brooklyn enjoying some floor time in therapy. Many of the milestones include mastery of gross motor skills, which refers to the movements of arms, legs and whole bodies to create movements and movement patterns, such as turning over, sitting, crawling and standing. You can help your baby develop his or her gross motor skills by allowing the baby to spend as much time as possible out of swings, gliders, activity seats and other forms of containment and as much time as possible engaging in floor play. Lift your baby’s feet up and move them around in a bicycle motion. “Bicycling” and allowing the baby to have tummy time are great ways to ensure that the baby will have the muscle control needed to kick and play and to lift his or her head. More tummy time. At this point, you may start shaking rattles and trying to get your baby interested in grabbing at items while on his or her belly. This is also the time to encourage rolling. You can start by moving one leg for your baby and the rest of the body will follow. Supported sitting also starts at this time. Place your baby in a sitting position and then hold him or her at the hips for support. Allow the baby to reach all around. Your baby will begin sitting by himself in this time period. Place toys all around and let your baby explore. You may also start working on standing. Place toys on a low sofa cushion or table and position yourself behind your baby to ensure he or she is safe. Allow your baby to explore by crawling around as much as possible. At this age your baby may start pulling up onto everything and trying to stand on his or her own. To aid in beginning to walk, hold your baby’s hand and let him take steps until he feels comfortable enough to try it alone.